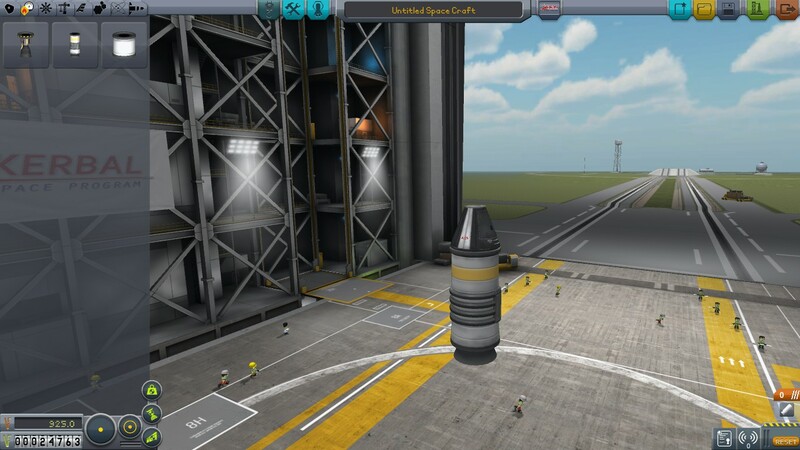 Kerbal Space Program is an Early Access title in Beta. This means the game is not fully optimized and various bugs are present. However, this also means that Kerbal Space Program is continually being updated, refined and improved based on YOUR feedback. 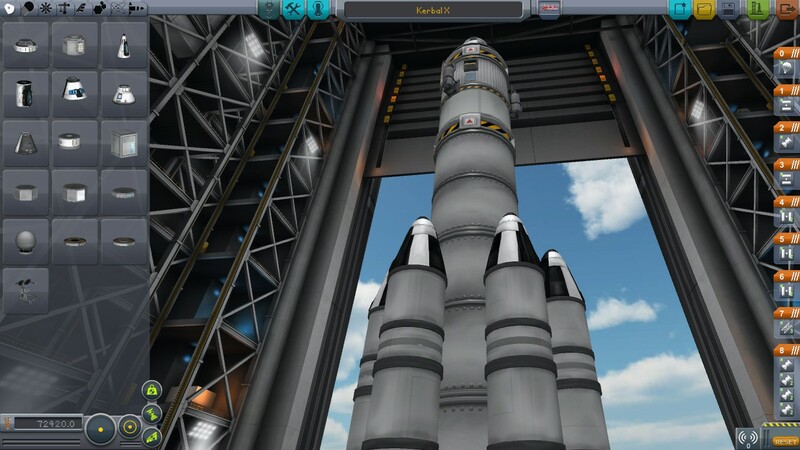 Kerbal Space Program (KSP) tasks you with building your own space program. This means players will be building spacecraft, hiring astronauts, taking on contracts, conducting Scientific research…etc. This Kerbal has exited the rocket and looks out over the Mun and Kerbin (Kerbal Space Program’s fictional equivalents of the Earth and Moon). 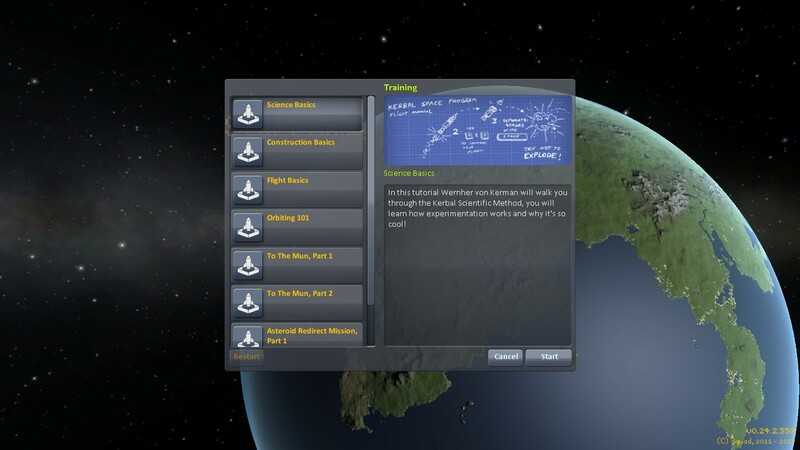 KSP is educational in all but name, not only teaching concepts such as mass, thrust and lift, but actively requiring players to put this knowledge into action. Even small adjustments to an aircraft can change your center of mass and mean the difference between success and disaster. 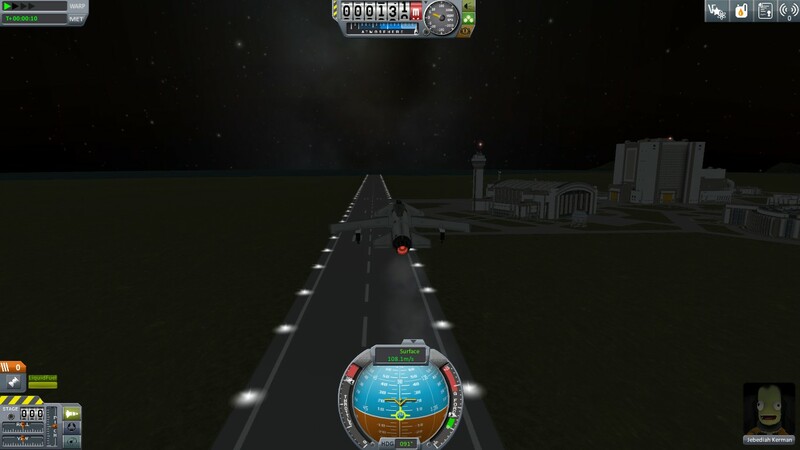 My first (and so far, only) successful takeoff. 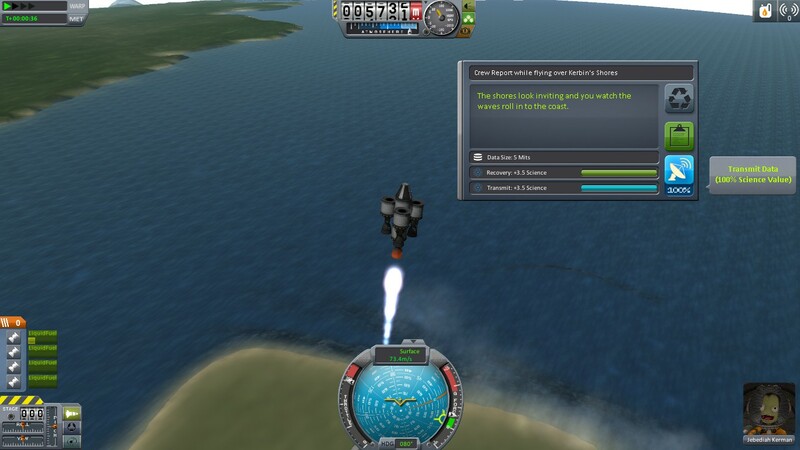 Kerbal Space Program’s ability to make scientific concepts relevant and fun has even attracted the attention of the National Aeronautics and Space Administration (NASA). 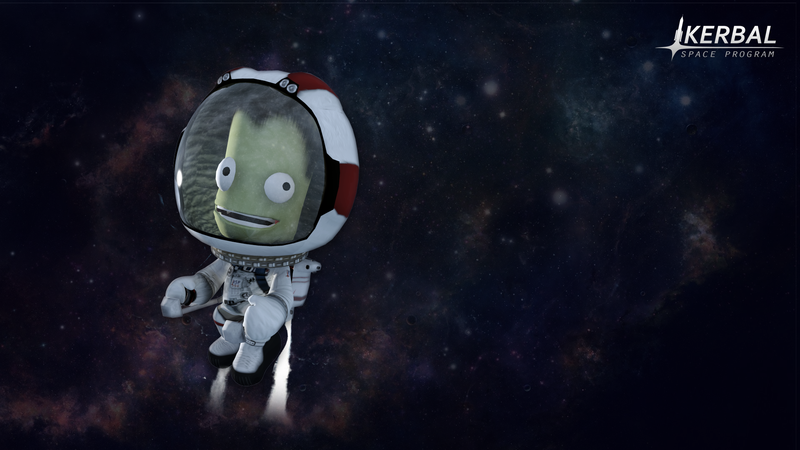 In a collaboration with NASA, the developers of Kerbal Space Program implemented gameplay mechanics and missions directly inspired by real projects. The NASA Asteroid Redirect Missions join a number of other interesting gameplay “Scenarios” or challenges. 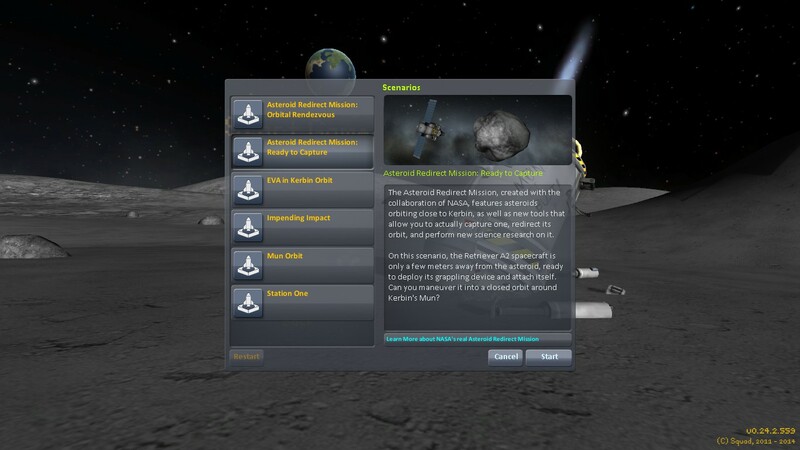 This mission series in particular task players with redirecting an asteroid into the Mun’s orbit and performing experiments on the asteroid surface. Despite the potential educational benefits and overall complexity of Kerbal Space Program, you don’t have to be a genius to enjoy the game. A number of well-designed and thorough tutorials are included to assist new players. The developers often routinely direct players to the informative videos of Scott Manley as well. The process of creating a spacecraft is simple, utilizing a “drag-and-drop” interface. Ship components snap together easily through green contact points. Other parts can be placed nearly anywhere on an aircraft, provided there is space available. 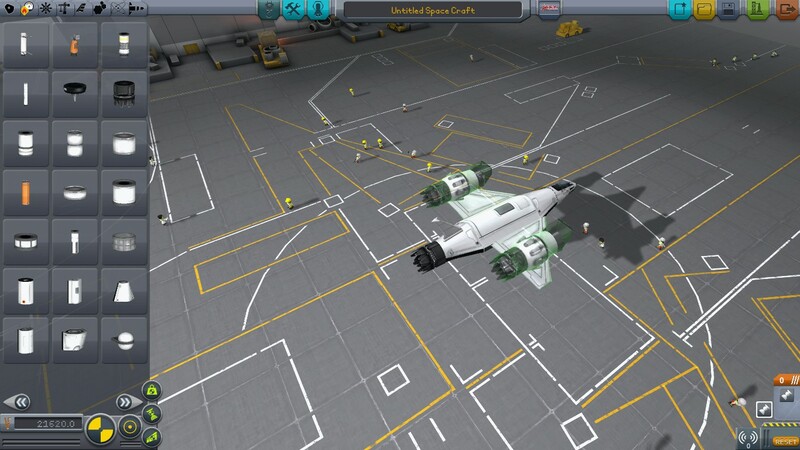 A “Symmetry Mode” helps balance vessels for successful flights. This also makes constructing complex designs both easier and less time-consuming. 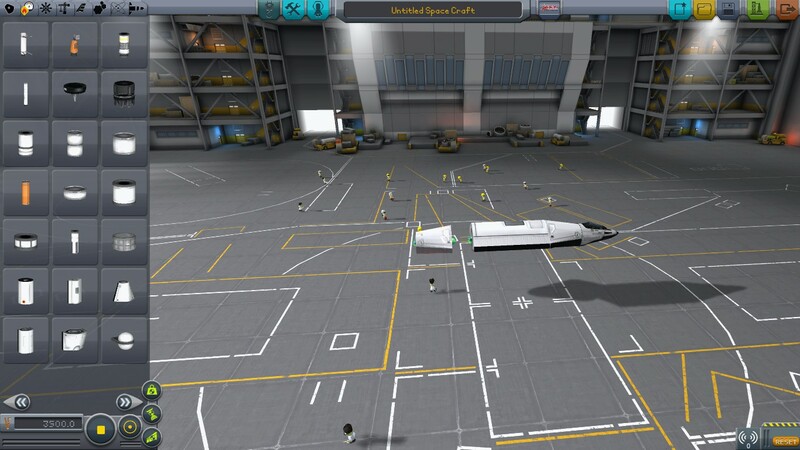 After completing one airplane wing, I can enter Symmetry Mode and attach an identical one to the other side of my spaceplane. 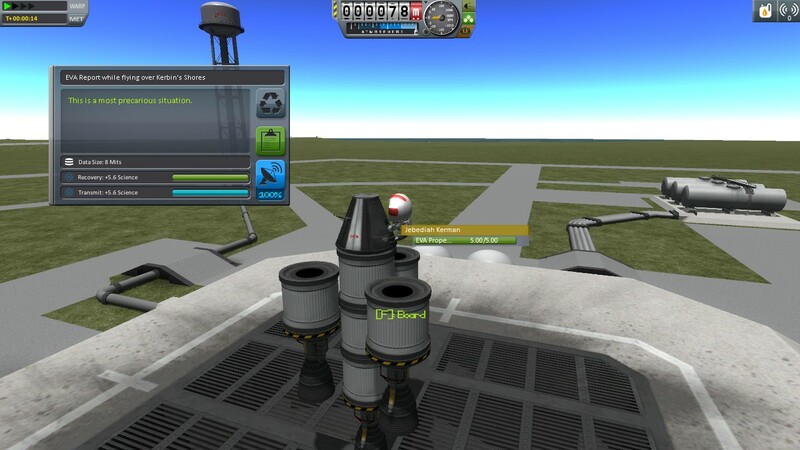 Because Kerbal Space Program is based upon scientific principles/physics, pressing a few buttons allows you to see the center of thrust, mass and lift of your vehicle. This allows you to make appropriate adjustments to your craft. The purple ball represents your center of thrust, yellow your center of mass and light blue your center of lift. 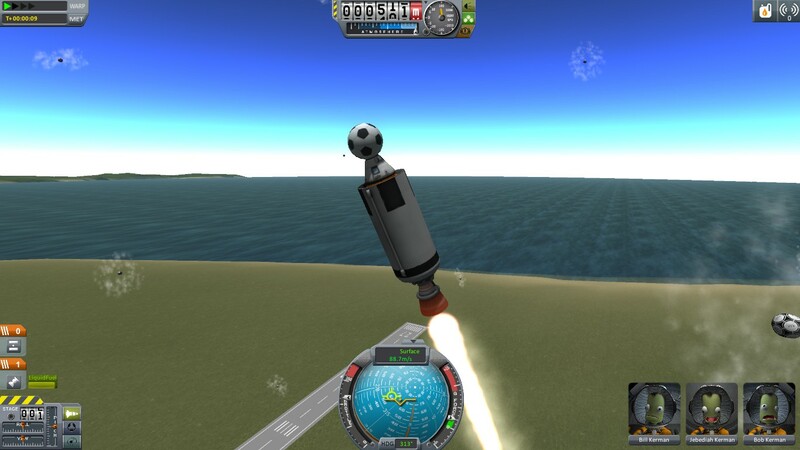 Kerbal Space Program has developed significantly since the publication of the video posted above. This is primarily due to the massive “First Contract” 0.24 update. Some of the many, randomly-generated contracts available. This contract in particular is provided by the “C7 Aerospace Division,” and tasks players with testing an experimental Turbojet Engine. In the past, only two modes of play were available: Sandbox and Career. The First Contract update turned the old Career mode into Science mode and introduced a new, improved Career mode as well. This means there are now three modes: Sandbox, Science and Career. An impressive, developer-created rocket model. A…slightly more impressive player-created model shared on Reddit and imgur. 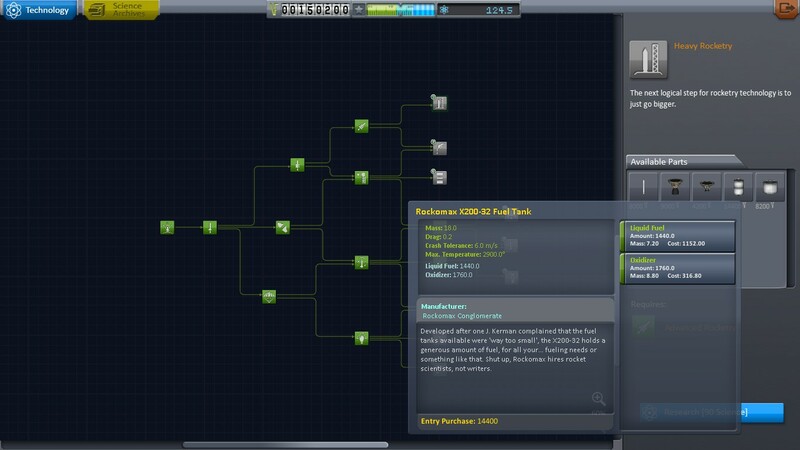 Science mode changes the formula by incorporating a “tech tree.” This means players start with basic ship components, unlocking the full set of parts by performing Science experiments and building spacecraft. Science points earned unlock further nodes on the tech tree. This “Heavy Rocketry” node takes 90 science points to unlock and enables (among other things) the use of heavier rocket engines. The component pictured is a tank which can carry a large amount of rocket fuel. This allows players to ease into the game and its many systems rather than instantly being confronted by a large variety of parts with no idea as to their meaning. Although your selection at first feels very limited, the process of unlocking ship components allows you to become intimately familiar with your toolset as it expands. Science experiments are performed by collecting surface samples and conducting crew reports/EVA (Extra-Vehicular Activity) reports. More methods of research are unlocked as players progress through the tech tree including observing temperature, conducting research in a science lab, etc. You’ll conduct crew reports by clicking on the cockpit of your vehicle. Data can either be kept and used once the mission is complete, or transmitted wirelessly for a fraction of the total Science point value. 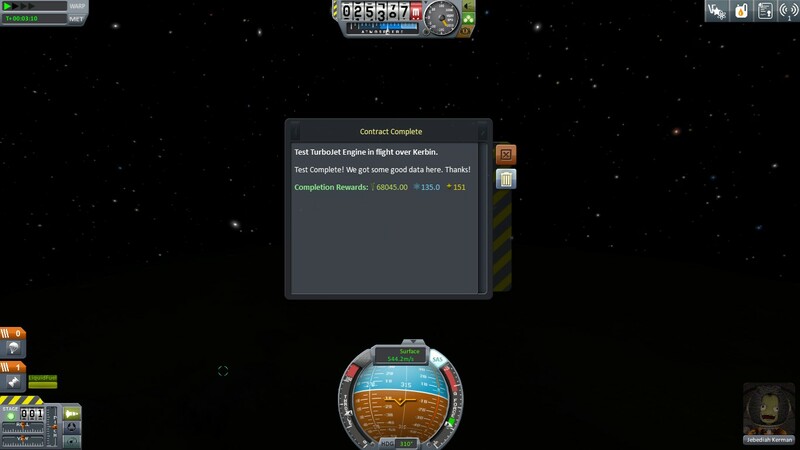 EVA Reports are findings taken outside of your spacecraft by right-clicking on the Kerbal/s you’ve brought on a particular mission. 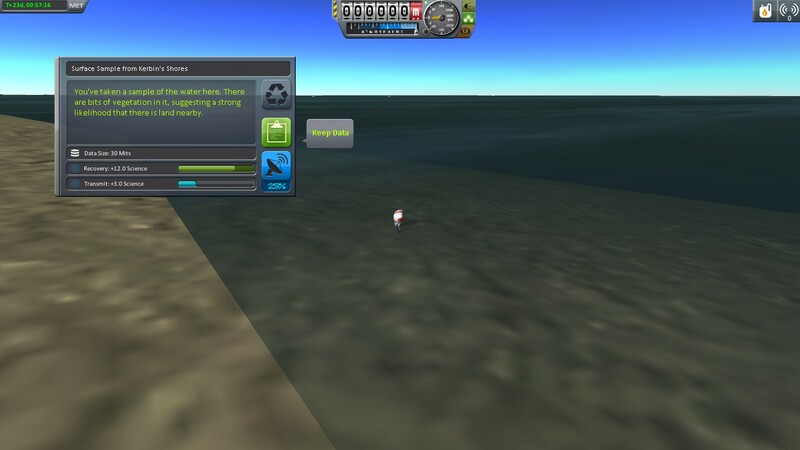 Surface samples are taken from the surface of planets (again by right-clicking on a chosen Kerbal). The updated Career mode expands upon this foundation with the introduction of Contracts. 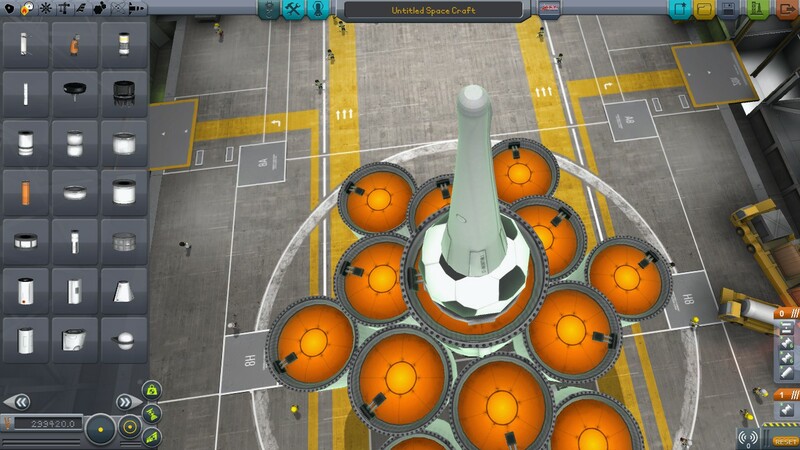 Contracts provide both goals for task-oriented players and a framework to the construction of your space program. Contracts also tie into the new Funds and Reputation systems. 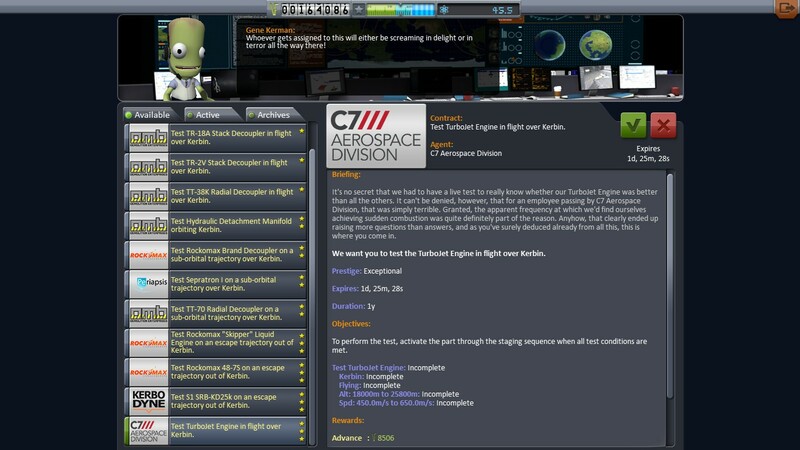 The “Orbit Kerbin” contract is one of several major milestones in your program that determine what missions you are assigned. Completing this contract gave me 68,045 Funds, 135 Science points and 151 Reputation points. 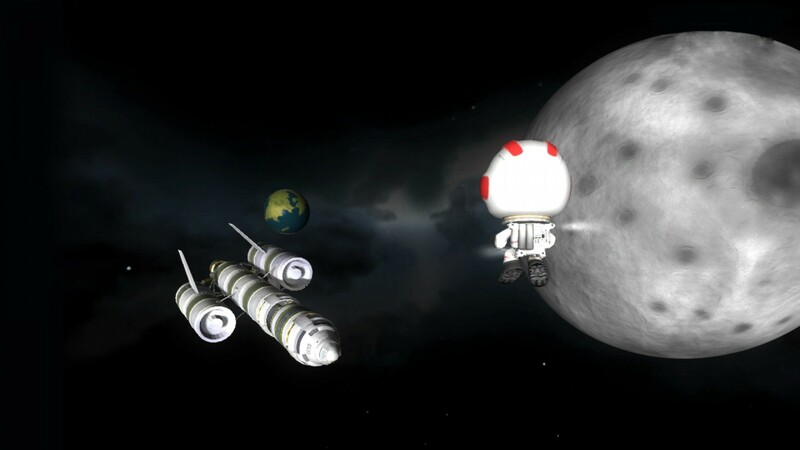 Kerbal Space Program is host to a large and enthusiastic fan community, who have contributed to the game through free downloadable mods and effects. 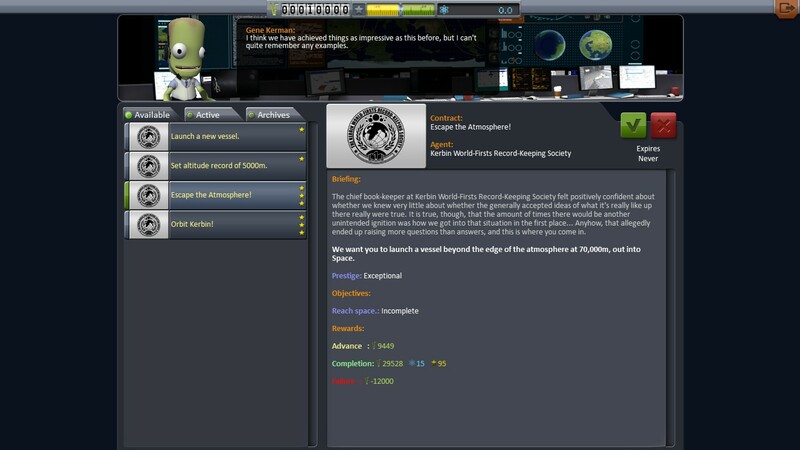 The developers of KSP (Squad) even published their own official mod celebrating the World Cup. 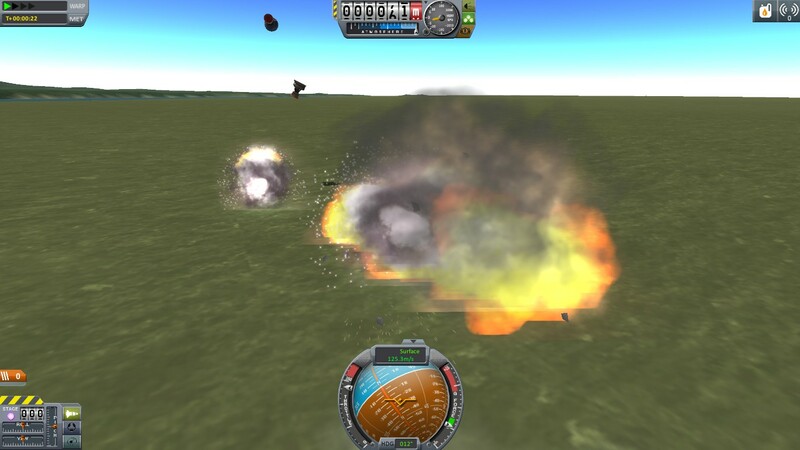 Underlying Kerbal Space Program’s complex systems and robust amount of gameplay options is a jovial sense of fun. Somehow, the sense of humor seen in item descriptions and unexpected physical reactions can get you laughing even while your latest attempt explodes into tiny pieces. 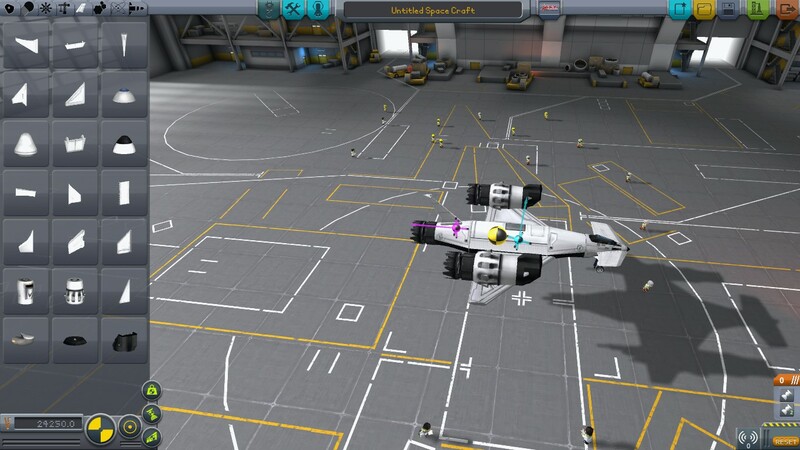 That said, Kerbal Space Program is a must-buy. *This title was received for preview/coverage. See our statement of ethics here and game review criteria here. 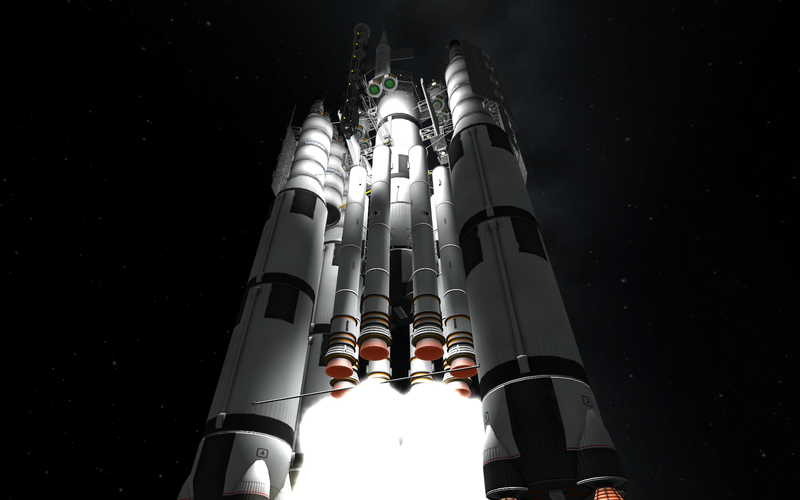 This entry was posted in Uncategorized and tagged 0.24, Alpha, Bible, christian, christian gaming, christian review, christianity, Contract, Early Access, family-friendly, flight, gaming, God, indie, Jesus, Kerbal Space Program, KJV, KSP, paid, PC, research, review, salvation, sandbox, spacecraft, spaceplane, Squad, Steam, video game, video games, video games and the Bible, Video Games and the Bible Highlights, Video Games and the Bible Plays..., Video Games and the Bible Previews, Video Games and the Bible Video, videogames. Bookmark the permalink.